There is only one thing that you need during a chilly night; that’s the best electric blanket. These blankets are used to pre-heat the bed to help you keep warm on cold and chilly nights. Whether you install them over the bed sheet or below the bed sheet, they will still serve the same primary purpose – keep the bed’s occupant warm. Electric blankets come with heat settings which help users control the level of heat they want for themselves. This is the control unit that determines how much heat is produced. In that regard, larger blankets meant for couples or more than two people who sleep in the same bed may come with a dual-heating setting or a separate control unit. Which gives you a chance to sleep under the temperatures of their choice. It is not only warmth that you’ll get from the electric blankets. They can also help to alleviate symptoms of some medical conditions like arthritis, allergies and menstrual pains for women. However, electric blankets have to meet certain safety standards to avoid over-heating. You want to be sure that the blanket can keep you warm all night without any risk. The good thing is that some brands turn off automatically after your set time elapses. Anyway, if you are just planning to get a new blanket or replacing the old one for yourself or family, read on because we have compiled a list of the best electric blankets you want to have on your bed. But before that, let’s get to know these blankets better. What Is an Electric Blanket? An electric blanket is a kind of blanket made from heavy, sturdy materials and comes with an internal wiring system, which uses coil wires to produce heat and warmth. The blanket uses insulated wire oftentimes plugged in the electrical outlet. During this time, the blanket heats and you can control the levels of heating by reaching out to the temperature control unit which is located between the blanket and the electrical outlet. Most electric blankets are made from combining polyester and acrylic materials. These are usually non-flammable in case of a potential fire. But they do a great job in trapping and keeping the required warmth in the bed. There are three common heating levels in this blanket and that is low, medium and high. You can change these levels using a remote (usually attached) by simply pressing the button. An electric blanket system contains a series of interconnected coil wires with a protected heat-resistant coating. When you plug this unit into your electrical outlet, it provides a constant source of heat while using 120V of electricity. After the wires have heated to the desired temperatures, they are used to either pre-heat the bed before you sleep or during the sleep. It all depends on your preferences. Big connectors located at the end area of the electric blanket are used to transfer electricity from the power source to the wires inside the blanket. And you will need to unplug the connectors when washing the blankets. Ensure that the connectors are placed at the foot of the blanket during use. This is a safety measure you must observe while using the electric blanket. It makes sure that the blanket remains intact without disconnections or overheating due to movements during sleep that could cause plugging and unplugging of the connectors hence interrupting the power source. The modern designs even come with temperature gauges and thermostats which can read both the body and electric heat levels and use that combination to provide you with the best sleeping experience. On top of that, they have automatic shut off mechanisms that instantly turn off the blanket when it reaches a certain heating level – particularly when it starts overheating. Pre-set heat settings in some safer models enable you to set in advance, the time when you want your blanket switched on and off. 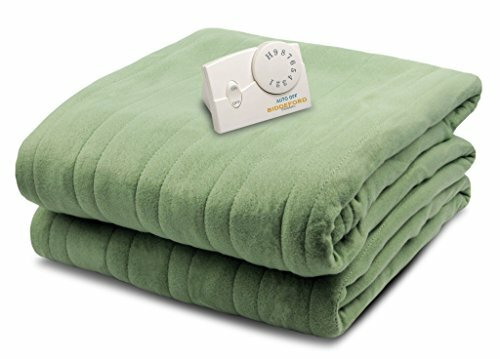 The top electric blankets have a number of advantages when you use them. Here are some of them right next. The electric blanket can be a great “green” way to save energy. They do not use a lot of electricity. Generally, most electric blankets are not expensive to run. This is because they use low wattages of electricity. They are designed to have a transformer which cycles heat before its drawn into the blanket rather than directly drawing the heat from the outlet. When you buy a high-quality electric blanket, you won’t have to worry about its durability. It is able to last for so many years when you maintain it properly. Provided you follow the instructions that come with it, you should be able to wash or clean your blanket without damaging the internal wiring system to prolong its life. Safety is a guarantee with electric blankets from the reputable brands. The blankets go through a thorough testing process just to be 100% sure that they are safe for use. They are made such that during heating, there is an even spread of the heat in the blanket. To minimize the risk of accidents such as fires and electrical damage, modern designs come with a shut-off mechanism. Since the blanket has a temperature control setting, you can always adjust the heating to the level where you feel comfortable. You can reduce the blanket humidity which helps to reduce the presence of dust mites. Hence, eliminating the discomfort created by these mites. This is important for individuals who suffer from poor circulation. They need to keep warm throughout the cold, chilly nights. These blankets can supply that steady heat during this period. The following are three basic types of electric blankets you need to know. Electric overblanket or duvet is the most common type known among many people. It comes in the same exact style as the duvet which is usually used in summer. You will get them in different styles and designs. They are thick and provide comfort to the sleeper while supplying consistent warmth throughout the night. On the other hand, this electric cover is put directly on top of the mattress, below the bottom sheet. It looks like a heated mattress pad. Generally, they are thin to allow your fitted sheet to fit your mattress properly and yet they provide a consistent supply of heat during sleeping. This one is designed to be thin electric linen for decoration or for use on home furniture. They have also been created with an internal wiring system to provide warmth during the cold times or winter. You now know what this top electric blanket is all about including how it works. If you want to purchase a new one or an upgrade, there are a few considerations you should make before you go shopping. Here are the top considerations you must look for. With a high-quality electric blanket, it should be able to last you for not less than 5 years if you take good care of it. Look for the blanket fabric that is strongly woven and highly flexible to resist repeated washing and drying. The internal wiring system should also be flexible and well installed while the control settings should function properly always. Depending on how you plan to use the blanket, you can either decide to choose an overblanket, underblanket or an electric throw. Blankets are also great for queen and king sizes bed. Underblankets can be great when you want to keep warm while in the bed. But if you think that your mattress is not compatible with the electric blanket, you may need to go for the overblanket. It could work better since it comes on top. Be careful not to use underblankets on memory foam mattresses especially when set at higher temperatures. Safety is one of the most important concerns when you are buying your electric blanket. You can try as much as possible to avoid cheap blankets thinking that you saved money. Look for the electric blankets made from high-quality fabric and manufactured under strict safety guidelines. Not only will you guarantee yourself a safe, quality product, but also better sleep quality. Check if the blanket is marked with the KEMA-KEUR, ENEC05, CE, and Underwriters Laboratories safety standard symbols, Which are EN60335-2-7-17, EN60335 and UL 964. If you are in the United Kingdom, then consider BEAB. Such are safe blankets. Don’t buy an electric blanket if it doesn’t have those marks of certification. Different fabric materials are used to make these blankets. For example, there is cotton, polyester, and fleece, which provide varying levels of comfort to the sleeper. Since you know what is best for yourself, choose the blanket that would meet your sleeping needs in terms of comfort and to make you cozy at night. You can consider those electric blankets that come with automatic controls. It makes it easy for you such that you just preset the temperature to your desired level, and also set the time when you expect the blanket to shut down so that it doesn’t heat beyond limits. This saves you on the electricity as consumption is usually minimized. Just get to understand your controller so that it will be easy for you to explore all the heating settings. Electric blankets are sensitive products that should be manufactured with both highly technical and industrial standards. The brand or company should have the needed technical expertise, use quality materials, be reputable in the industry and be able to provide safety information about the product. So, you should be looking for such brands and not the ones you don’t anything about them. Similarly, look for the newer models of the electric blankets. This is because they come with automatic shut off features which help to prevent overheating of the blanket. Buy an electric blanket that you will be able to use and care for easily. Therefore, you must understand how the blanket works before you take it home. It should be easy to grasp the controller and do adjustments and the dial settings should be bright, large and straightforward to give you ample time to handle the gadget, especially if you don’t have good eyesight. It is good to purchase a high-quality electric blanket. The materials used to make them are also high-quality, durable fabric. And these blankets are made under strict safety guidelines and standards. Such products are going to cost you a good amount of money. But, it is worth the cost since your health and safety are high on the list of priorities. The best quality blanket also significantly improves your sleep quality. On the electric blankets, try to avoid cheaper models. While the electric blankets provide warmth and it looks to be fun using them, you need to take serious caution. All the guidelines in the Instruction Manual MUST be strictly adhered to without compromise. Read through this summary carefully and understand before you begin the installation and use. Avoid using the electric blanket in the adjustable beds, reclining chairs, sofa bed or in situations similar to these. If you use them in these circumstances, you can easily pinch the wires and it’s dangerous. Your pets should not play around the heated electric blanket to avoid them putting their claws or teeth in the wires. This could puncture the wires. Avoid completely and never use an electric blanket on a water-supported bed. During storage, do not loop the wire cord around the controller as this may destroy the system. Do not use electric blankets on infants or very small children and persons with disabilities. As long as the person is not able to operate the blanket on their own, avoid using the blankets on them. Don’t use pins on your electric blanket to avoid puncturing the wires. Sunbeam Microplush Heated Throw is made of soft, 100 percent polyester that will give you that gentle wrap with constant warmth supply and comfort even on the coldest nights of the season. The cozy fleece material makes you feel extremely comfortable and cozy in your bed. 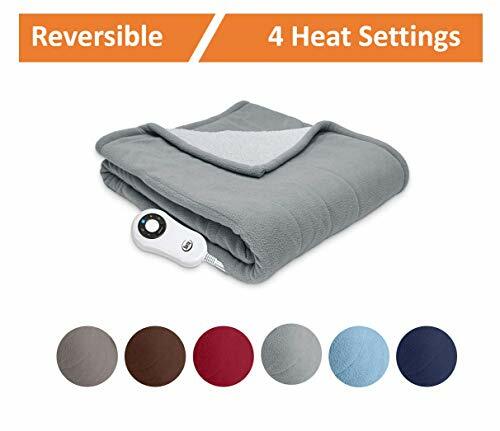 This top heated blanket comes with a Thermofine warming technology which enables you to set how much heat you want to be supplied in your blanket and for how long. This thermofine system can sense and adjust itself to ensure this supply is consistent. This best heated blanket is easy to handle and maintain as it comes with the primestyle lighted controller. The controller is super-easy to see and even use with 3 heat control settings and a 3-hour shutoff function. These heat levels enable you to choose and set what level you find comfortable for yourself. Then the shutoff function ensures that the blanket does not overheat by shutting down automatically when the heating goes beyond the limits expected. This, in the end, gives you peace of the mind. While you enjoy the plush softness and warmth provided by Sunbeam Heated Throw, be sure that the polyester quilted fleece electric blanket is here to serve you for a really long period of time. The electric blanket is durable, machine-washable and dryer safe – therefore no need to worry about cleaning or drying it. Just remove the control panel and connectors before you toss it in the washing machine. It also comes with a strong 5-year warranty that gives you confidence and satisfaction that the product you are taking is the best quality. This electric throw by MaxKare is a 50” x 60” full-body comfort with fast heating mechanisms. The luxuriously soft side of silky flannel and the other side with sherpa shu velveteen work efficiently to provide steady heat for your warmth and comfort during the cold night. The blanket is made with premium quality fabric that will stay for extended periods of time while using it. It warms between the temperatures of 95 and 113 degrees F. The blanket turns itself off automatically after 4 hours of continuous use – this is a vital safety feature found in the MaxKare Electric heated throw. And it ensures that this best heated blankets will never overheat even if you forget turning it off yourself. Maintaining the blanket is easy and does not involve a lot of work. This model machine washable and the detachable controller allows you to remove it and wash the blanket for hygiene. The fabric materials used to make the device are also easily washable. However, hand washing is strongly recommended to avoid fabric damage that can occur when it’s machine washed under higher temperatures. Also, avoid drying this blanket in a dryer as recommended by the manufacturer. This is done to prevent damaging the heating wires. Thus prolonging its life. At just $47, it is a bargain to get this blanket looking at what it provides in terms of comfort and warmth. It also comes with flexibility and versatility. For example, the long power cable (9.8 feet) does not restrict the electric blanket to certain smaller distances when you are using it. It can operate flexibly even when used in wider ranges away from the electrical outlet. If you don’t want the heating features, simply detach the controller and you will be having a normal blanket for a normal night. The stylish blanket has been certified by ETL and, therefore, you can enjoy its warmth knowing that this is a high-quality product; reliable and trustworthy as far as your health and safety are concerned. With this Serta Reversible, sherpa/fleece premium electric blanket, you have exceptional comfort and irresistible heat supply and warmth in your bed. While the extremely soft 100% polyester micro plush offers to you what you may not get in most other electric blankets. For instance, the 5-heat setting that gives you the freedom to choose your own level of warmth that meets your comfort needs. The controller comes with an 8.5 feet power cord which makes you imagine the huge range you can actually use your blanket. If you are forgetful, you may find the 4-hour auto-shut off feature quite handy as you will receive heat supply within the preset 4 hours after which the system would shut itself automatically. So, you don’t need to worry about overheating and your safety. The shutoff system also helps you to save on electricity and it’s convenient. The blanket is machine washable and you can dry it in a dryer for easy care. The three-year warranty from the manufacturer indicates that it’s a product you can rely on for convenience, safety, and high performance. 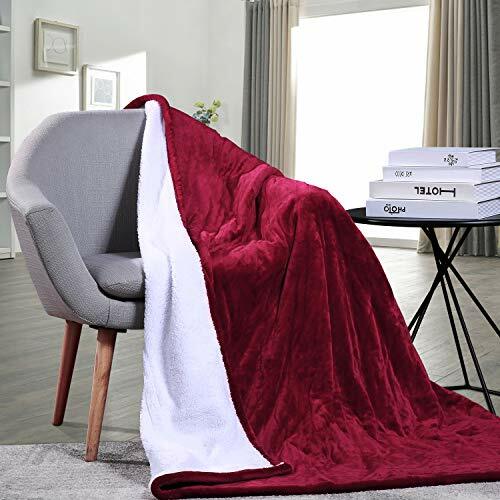 You can use the throw with more than one person looking at its generous size of 50 x 60 inches – it offers full-body coverage. Place it on your chair, couch or bed, and it will still serve the purpose you bought it for. SoftHeat comes with softest plush fabrics on the market. Its technology is easy and safe to use as you warm in your blanket through the chilly night conditions. The unique preheat feature ensures that your bed is adequately heated before you jump in later on. Whether this is a queen size, king or Cal King, you can be sure that they will have the dual controllers to allow more than one person to use the electric blanket while enjoying their own heated zones without interfering with each other or sacrificing their preferences. The blanket system also comes with a patented safe and warm low voltage technology (less than 25 volts) keeping you safe as you stay in the night. It includes a small power supply box which converts 120 volt AC power into low voltage DC power that cannot be hazardous at all. The blanket draws its power from the soft, low volt DC current to supply you with consistent warmth, protection, and safety. The SoftHeat blanket features thin wires carefully and evenly secured within the structure at 3 inches apart right from the head to the toe. This makes the supply of heat and warmth to the blanket to be even without some areas or zones being cold or others being extremely hot. Unlike the regular warming wires, this electric blanket’s wire system consists of ultra-thin, flexible wires that are lay flat within the blanket. This enables you to enjoy the warmth comfortably without the feeling of irritation created by the bulky, thick wires of the traditional warming systems. 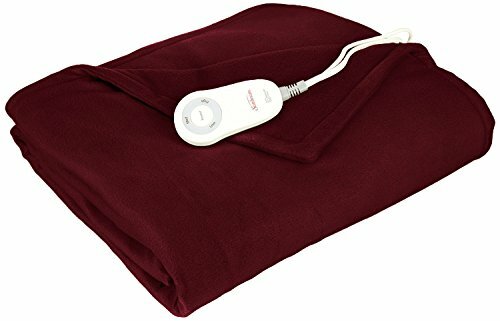 If you have been looking for the electric blanket which is soft to the touch and convenient, this one it is. It also has an additional inner layer of fiberfill and soft fabric – these provide you with more comfort and support as you sleep. The micro-fleece fabric is machine washable and even after washing, you can dry it in the dryer. It doesn’t pull off, shrink or stretch – indeed perfect for easy maintenance. This twin size blanket comes with a computerized temperature controller which you can easily read, turn and it’s non-slip (you’ll grasp it really well). You will also come to appreciate the large backlit display feature on the controller that allows you to adjust the temperature conveniently without having to turn on your bedroom lights. The auto-preheating enables your bed to heat and catch warmth before you climb for resting. The blanket also comes to be a great one when it comes to safety, convenience, and power conservation – this is due to the 10-hour automatic shutoff feature that makes the blanket to turn off automatically after ten hours.You can get the giant 62” x 84” twin blanket with a clear warranty policy and support when you call the manufacturer. The warranty is 5 years long, so you can be sure about its quality and performance. This blue car adaptable blanket by Stalwart is here to make sure that you don’t have worries when driving in the cold conditions. It can be used virtually in any car, truck, SUV and would keep you warm regardless of whether you are just seated or driving, thanks to its long cord. You could be looking for something that just heats up quickly and stays warm for long; you have it with this electric car blanket. The long cord is very, very long that even the passengers on your vehicle seated in the back seat would get to enjoy the warmth provided by this blanket. If you are planning a road trip or camping, this polyester fleece stitched throw would just do fine. It is full of comfort, high performance and safe for use. It doesn’t draw out much electricity from your car battery hence it’s energy efficient. Therefore don’t start thinking that it will drain off your battery. At 42” x 58”, this large electric car blanket is going to stretch across the whole backseats of most cars and trucks without any trouble. The blanket is designed with thin wires running across its fabric. They supply adequate heat and provide enough warmth to keep you comfortable and relaxed throughout the entire night. It’s lightweight and folds for storing is very easy and takes not much of your time. The compact blanket can be stored in your car trunk or just at the backseat as it wouldn’t take up too much space. When cleaning this electric cover, just do spot wash only – it should not be placed in a machine for washing. When it comes to an easy-to-use, lightweight electric blanket, this Biddeford product is worth a wait. Its design is created from stitching 100 percent high-quality polyester fabric that here to stay to your full satisfaction, safety, and comfort. This may not be the fluffy, luxurious blanket type like most of the others are, but you can be guaranteed that it is soft to the touch. The Biddeford Electric Heated Blankets are built with the heating mechanisms that consistently provide you the heat and warmth at the levels you desire during the cold nights. If you do not wish to buy this twin size, you can always consider going for the full, queen or king sizes all available to you. The controller has 10 personal heat settings which are quite enough to help you adjust the temperature to the standards you want in your blanket any time of the night. Good thing to note is that the queen and king-sized electric blankets have two controllers; so that would allow you to control the heat level on each side of the blanket. This Biddeford covers both partners using the same blanket as each of you would still enjoy the temperatures they like without offending one another. The smaller sizes only come with one control panel and therefore good for a single person. The controllers are also dial-style where you will need to click it over one direction for higher heat numbers or the other one for lower heat numbers. This Biddeford is easy to operate, right? Then the on-off switch can be located quite easily also – thus, right in the middle of the night, you can still operate your controller. You also have the liberty to choose among the 5 colors, Biddeford blanket comes with. These are cloud blue, fawn, grey, natural and sage. 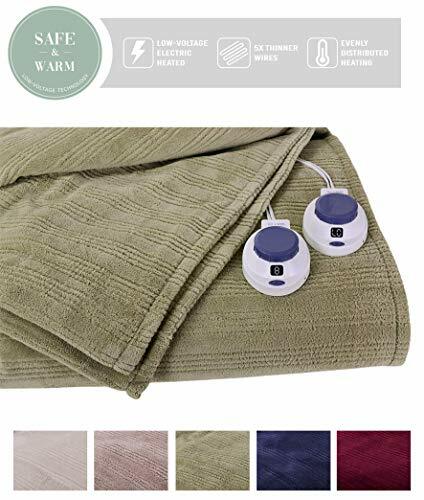 Unlike other electric blankets, this one does not have a preheat function but you can still preheat your blanket by turning it on before you go into bed. This Biddeford blanket is safe to wash in a machine and you can line dry it to make sure that you do not damage its connections. The five-year warranty offered by Biddeford is an indication that this product is a premium one. In the event that it doesn’t turn in the desired performance when you buy it, the warranty gives you a window to return it. An electric blanket is one of the most thrilling technologies of the modern age. Given that you can sleep in a cold, chilly night or winter without being worried about your comfort (thanks to the electric blankets), is a step ahead in the world of invention. Many models of electric blankets exist in the market but we have made it easy for you by researching on some of the best you can have for the ultimate warmth and safety. You need to strictly adhere to the safety measures stated when using these kinds of blankets. Enjoy the best sleeping experience by choosing the best electric blanket today.